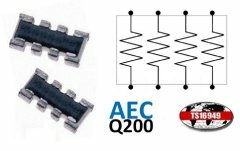 NIC is pleased to announce the addition of NRSNS series of Automotive Grade Thick Film Resistor Arrays to its expanded offering of automotive grade components. The anti-sulfur construction of NRSNS series meets AEC�-Q200 testing requirements, for use in automotive and harsh environment applications. Supplied in miniature (0402x4 & 0603x4) sizes, in isolated 4�-element low cost thick film construction, the NRSNS series is ideally suited for use in a wide range of termination, pull-up, pull�-down, and current limiting applications. With low profile (0.6mm height) and 0.5mm/0.8mm pitch convex type terminals, NRSNS parts are perfect for high density circuit designs and have advantage for reduced PCB assembly costs, with both fewer component placements and reduced PCB area used. NRSNS series operating temperature range is �-55°C to +125°C (Pd derating above +75°C) with voltage and power ratings of 25V, 1/10W and 50V, 1/16W per element. Resistance value range covers 10Ω ~ 1MΩ in F (±1%) and J (±5%) tolerances, with TCR of ±200ppm & ±300ppm. Zero ohm jumper versions are also supported with 0.050Ω max resistance and 1.0A current rating. Supplied packaged on carrier tape, for automated pick and placement and compatible with both legacy and Pb-Free soldering processes. NRSNS series is RoHS compliant with unit pricing from $0.005 each. Contact NIC today to review your requirements, and request free samples for design and evaluation purposes.